Afternoon all. My gents dresser is nearing completion, almost. I’m in the process of building the drawers. Any drawers I’ve built in the past have been fairly small and as such I did not add slides. The dresser on the other hand has 3- 35wx19dx7h” drawers. I’m concerned that they may be difficult to open when fully loaded. While I’m not fond of slides, as I think they distract from the dove tails, I may have to add them. Any thoughts or experiences would be great. Blum undermounts. You’ll like them. Amen to both of those. However – and, I’m no furniture maker – some of the greatest furniture in the world was built centuries ago, before there were such things. Learn from history. I’m sitting at a roll-top that was built, probably, in the ‘20s or ‘30s, and it has no slides at all. The drawers simply slide on the platforms upon which they sit when closed, and there’s a runner at the top that keeps them from flipping forward as they’re pulled out. Mark, I can add few things here. 1. If your drawers have already been cut, then you may not have enough clearance under the drawer bottom for under mount slides. They need about 1/2” IIRC. 2. 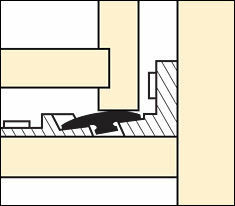 Drawers that are wide and relatively shallow are more prone to jamming, therefore, the fit is really critical. You can ameliorate this by adding a guide rail in the center, but, again, you may not have enough clearance if you weren’t planning for it. 3. I think BlueRidgeDog’s suggestion might be your best bet. 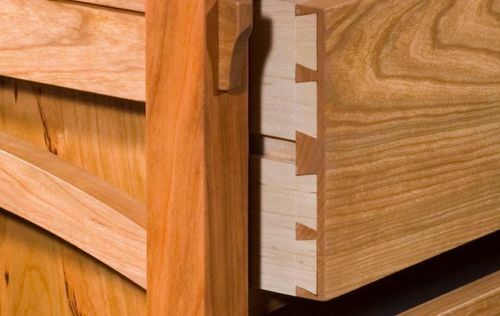 There are a couple things to help the drawers slide more easily: use an oily hardwood for the runners, like rosewood or add strips of UHMW tape for the runners to rest on. Maybe the easiest option is to apply wax to the runners. I use Johnson’s paste wax, but any other brand would work. Please post pix when your dresser is done, I always enjoy looking at your work. Thank you for all the response gents. Art. Love your word! Cruising threw the L/V on line catalogue I found these disc rollers. Any one have any experience with these? Forgive my ignorance on this subject, but what is the stigma with using mechanical slides? Is it to keep the piece more period? Partially that CW. 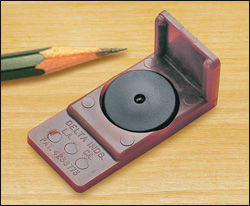 I don’t want to do all the work of half blind dovetails and then distort the picture with a metal slider in the middle. Don’t care for the sound either. JMTCW. I have seen plenty of dressers that don’t function very well. It’s my personal believe that if mechanical slides were available 200 years ago furniture makes would have use them. I love mechanical slides functionally. Depending on travel you pick the slides allow you to pull the drawer full open + an inch or an inch and a half and they don’t tip downwards. Blum and some others manufactures fixed the esthetics for those who are opposed to the visible side mounts. My 0.02 cents. Mark is the dresser to match the bed in your projects? If so, it would not be doing your hard work justice if you use those plastic things. A drawer 3 ft wide is not going to work very well at all with no slides. Bare bones, I would use a wood on wood center guide. A well made drawer functions for hundreds of years without them. There is a stigma to them in that you can make a drawer that is approximate, then it also limits you generally to overlay drawer faces…with each step you are edging towards kitchen cabinets and away from furniture. No harm in using them, but they are designed for mass produced kitchen and office casework and are not needed for a perfectly fit drawer. I have put lots and lots in when I made cabinets and use then extensively in shop or office casework. The undermount ones are changing this trend and you can have a perfectly fitted drawer, inset face and a smooth slide. We are living in the 21 century. If you are a period builder, or doing reproduction cool. If you don’t like metal slides cool. You have to please yourself that for sure. Like I said in a another post I prefer a draw I can pull out all the why and it doesn’t tip and the function remains constant thru all seasons.